I am so excited about this recipe! I saw Jeff Mauro prepare it during a recent show of The Kitchen, and just knew I had to try it right away. Right away as in same day. That’s what happened. And then I could not wait much longer to share. Eggplant is a tricky veggie. 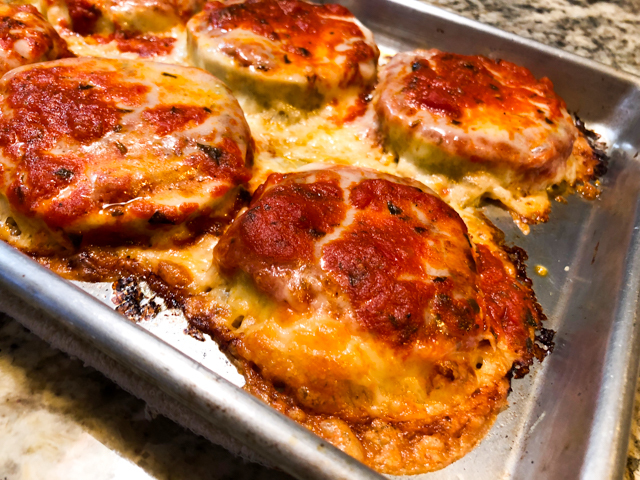 It soaks oil like nobody’s business, I love eggplant parm, but usually avoid the breading and the frying and end up with a very simplified version starting from grilled slices. It is ok, but compared to this method? It doesn’t even seem like the same recipe. Try it and I know you will be amazed. Heat a baking sheet – empty – in a very hot oven, 450 to 500F. While the baking sheet is heating, peel the eggplant, cut crosswise in 1/2 inch slices. Reserve. Put the eggs, water, salt and pepper in a small bowl and whisk to combine. Mix the breadcrumbs and Parmigiano cheese in another bowl next to it. Dip each eggplant slice into the egg wash, but allow just one side to get wet with the mixture. Dip it in the breadcrumb mixture, pressing to coat, and carefully place on a rack with the crumb side up. Make sure you have the tomato sauce warmed up and ready to go, and the cheese slices also nearby. Remove the baking sheet (careful, it’s going to be very hot) and drizzle the olive oil to coat the hot surface. 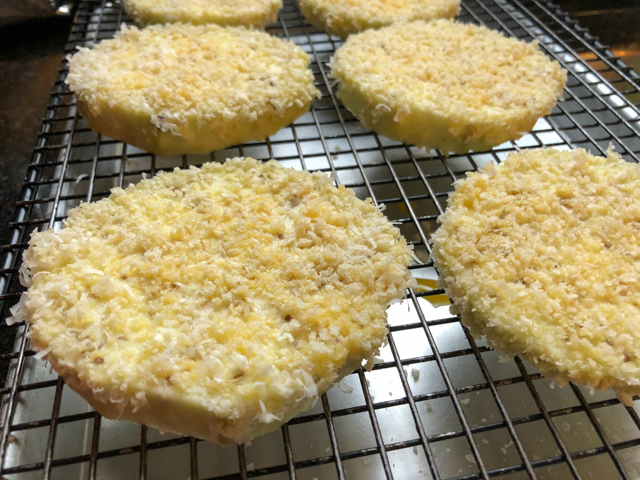 Working quickly, add the eggplant slices with the crumb down. It will stick to the oil and start to get pretty hot right away. Add the tomato sauce on top, cover with cheese, and place in the oven, reducing the temperature to 375 F.
Cook for 15 to 20 minutes. I added a little extra tomato sauce on top after 10 minutes. When the cheese is starting to get golden brown at the edges, the eggplant will be done. Serve right away with your favorite side dish. Comments: I hope I made myself clear about how much we loved this recipe. Eggplant without excessive oil? Check. Eggplant with a delicate crunchy component? Check. Eggplant cooked to perfection, not a slight hint of mush? Check. Melted cheese with a bonus of browned up edges to nibble on? Check. I doubt I’ll ever make it any other way. For the two of us, one-quarter sheet pan held 6 slices of eggplant, perfect for our meal with two slices leftover for a light lunch next day. That was exactly one eggplant. I used store-bought tomato sauce this time (Rao is a brand I like very much), and provolone cheese instead of the more traditional mozzarella. I do hope you try it and let me know if it will make you do an extended version of a Happy Dance. Now, when you make it, please skip the exotic maneuver I used. When I was about to crack the second egg for the egg wash, it slipped and headed at 9.8 meters per second squared to the floor. With lightning fast reflexes (I am very proud of that, actually), I grabbed it between my knees, but that cracked the egg. There’s only so much luck a person can have. Egg yolk miraculously stayed put inside the broken shell, but egg white made a truly epic mess in my pants. There was intense profanity going around, and a husband pretty much folded in two laughing. Thankfully, no pictures. But you can use your imagination, in case you need a good laugh, like some humans apparently do. « TRES LECHES CAKE: THREE TIMES A WINNER! Man that looks good! I will defitnely be trying this! Hahaha! Good catch! This does sound very good and it’s true how much oil eggplant soaks up tends to put me off this incredible vegetable. I’m falling behind on making your recipes. I haven’t had a chance to make the Tres leche cake yet and I’m about to go on vacation. This is a good find. Thanks for sharing it. It shall be made ASAP. Have used the same ingredients but what an interesting methodology! And am more than happy to use this amount of oil . . . actually have a beautiful aubergine in the fridge – hmm! Shall be trying! And looking whether any of our numerous food channels carry ‘The Kitchen’ With our surfeit of wonderful Australian cookery shows and all those from England, the programmes seem to have found little space from those from the US . . .
A real time saver for sure in my kitchen since we just love eggplant parm. I’ve made a similar recipe, but both sides were breaded works great as well. Lovely. I remember sautéing eggplant for the very first time, so I’m talking about one million years ago, and I must have used a liter of olive oil. It’s so unnecessary ! So now I just bake eggplant, no breading necessary. My husband won’t eat eggplant so I don’t care that it’s not pretty. But this does sound like a genius recipe. Thanks! Oh definitely. I remember when I started blogging I wondered if I’d ever run out of recipes. Then I laughed out loud! It’s definitely one of our passions. I’ve got planned posts through August, so when I come across a new recipe, like this amazing bacon-fried rice with peas I just had to make, it’s challenging for me to squeeze and alter my schedule! This recipe may just get me to make eggplant parmesan! Like you, I’ve never been a fan of the greasiness. P.S. How did you keep the pups away from the kitchen mishap? I wish there were photos!! OMG, laughing out loud over here about the egg between the knees. Classicaly funny! I really must make this, and will definitely let you know if I do. I lack the patience and advanced planning to let it sit overnight… but no doubt it is a great way to deal with it! You made me laugh at the image of you catching an egg between your knees, would have been a youtube sensation! I am going to try this recipe though. it’s such a nice technique… I hope you do try it soon! I made it! It was great! I’ll post it soon with a Bewitching Kitchen shout out! oh, that’s absolutely great! Will keep an eye for your post! I’ve gotta try this method. I’m very proud of my own crispy/greaseless eggplant concoctions, so I’m curious to see how this method stacks up against my “score, salt, and compress” prep. I haven’t used canned tomato sauce in probably close to 30 (40?) years. My Sicilian grandmother would have shivved me. But she’s dead now, so…Rao’s, you say? I may – may – give it a shot based on your recommendation here. But I’m warning you, if the ghost of my grandmother rises from the grave and starts coming after me, I’m sending her to you, vile temptress. Be warned. too late… I am beyond scared now… in fact, it was hard to sleep last night, after a vivid nightmare with an army of angry Grandmas chasing me with wooden spoons in hand! If only we could harness them in this corporeal world, the ISIS threat would be over in a week. Those spoons are deadly. indeed! that is my favorite tomato sauce, and I make it quite often… would make this recipe simply perfection! Made this last night, expecting to have enough for leftovers. Such a hit, it was all gone in twenty minutes. awesome! so glad you enjoyed it too! I saved this recipe and made it tonight. It was the perfect Good Friday night supper, with some freshly baked crusty bread. My slices were a bit thicker than 1/2″ so I need to bake a bit longer, but the result was great! It will certainly be on the table again. thanks so much for leaving feedback… I do feel strongly that this is a real keeper of a recipe, I was amazed by how much we enjoyed it, and it was so simple to put together! Thank you for the recipe! I made it tonight and we really enjoyed it. I liked how light it seemed it without all of the breading and oil. My breading on the one side did not get very crisp, but it may have been a function of my pan not being hot enough. One thing I could not figure out is where to add the Parmesan cheese. At what steps should we add it? I just sprinkled it on top of the mozzarella cheese and tomato sauce, but wondering if it should have been mixed with the bread crumbs? Please let me know, as I intend to make this again! will edit the post to include that…. thanks so much for bringing that to my attention!